What Can Shaheen Do for Brown? The New Hampshire Senate rumpus is taking on an air war v. ground war theme, as Joshua Miller reported in yesterday’s Boston Globe. 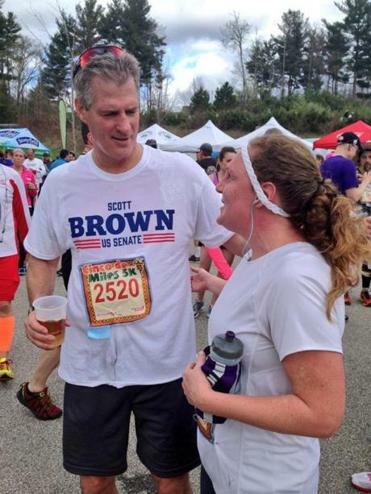 BEDFORD, N.H. — Beer in hand and sweat-soaked T-shirt sticking to his chest, Scott Brown made his way through the crowd of hundreds of fellow runners, many sporting fake mustaches or oversized sombreros. In his bid to unseat US Senator Jeanne Shaheen, Brown has placed an outsize emphasis on retail political events. From pouring drinks for customers at a restaurant in Lebanon, to meeting voters at a Market Basket in Epping, Brown has worked to exude an accessible image in New Hampshire, where meeting politicians is particularly prized by voters. Incumbent Sen. Jeanne Shaheen seems to be going the other way, despite her campaign’s weak protestations in the Globe piece. Shaheen had one public event on Sunday, joining the rest of the state’s congressional delegation and the governor at a ceremony honoring soldiers who returned from a deployment in Afghanistan this year. Shaheen aides said she has been focused more on helping Granite Staters through her Senate work than on campaign-style events. But, in a statement, campaign manager Mike Vlacich noted Shaheen had hosted the first in a series of “grass-roots summits” on Saturday, meeting with volunteers and supporters. “Our campaign is proud of the broad support for Jeanne Shaheen across New Hampshire, and regardless of who the Republicans nominate, we are building the grass-roots network we will need to win in a midterm election year,” he said. NEW IN THE AIR WAR — SHAHEEN LAUNCHES FIRST AD: Democratic Sen. Jeanne Shaheen is out with her first TV ad of the cycle, featuring Dwight Clark, a Vietnam vet, talking about her efforts on behalf of veterans. “We’d been promised a vets center in Keene for 30 years and got nothing,” he says in the ad. “Then Jeanne Shaheen grabbed the bull by the horns and cut through the red tape and got things going. She pushed it right through right from start to finish.” Shaheen’s campaign declined to share the size of the buy, but said the ad began running Sunday night and will go at least through this week on cable and WMUR. It was made by Grunwald Communications. Jeanne Shaheen gets the job done for New Hampshire? Better right now she should get the job done for herself. Which could mean giving TV commercials the air and coming back to earth, retail-style. This entry was posted on Tuesday, May 6th, 2014 at 9:47 am and is filed under Uncategorized. You can follow any responses to this entry through the RSS 2.0 feed. You can leave a response, or trackback from your own site.